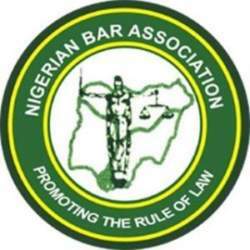 Nigerian Bar Association NBA – Promoting the Rule of law. Nigerian Bar Association NBA is a non-profit, umbrella professional association of all lawyers admitted to the Bar in Nigeria. It is engaged in the promotion and protection of human rights, the rule of law and good governance in Nigeria. It has an observer status with the African Commission on Human and Peopleâ€™s Rights, and a working partnership with many national and international non-governmental organizations concerned with human rights, the rule of law and good governance in Nigeria and in Africa. The Nigerian Bar Association (NBA) is a membership organization of all lawyers in Nigeria. The NBA has a membership of about 100,000 lawyers active in 120 branches across the 36 States and the Federal Capital Territory of Nigeria. it is organized into three practice sections, Eleven fora and two Institutes all supported by one National Secretary comprising of 36 (Thirty-Six). Staff Persons and administered by a National Secretary. The NBA offers a unique national footprint that is not available to any other civic or professional organization in Nigeria. Every two years, the NBA renews its leadership and priorities when it elects a new President and other officials. The tenure of the elected officials of the NBA runs for two years and i non-renewable. To rank among the foremost Bar Associations in the world. To use the law as an instrument for social change. Promoting the Rule of law. – Maintenance and defense of the integrity and independence of the Bar and the Judiciary. – Promote timely and affordable access to justice. – Support and promote law reform initiatives. – Protect and promote the principles of the Rule of Law and respect for human rights. – Promote and advance quality and functional legal education, continuing legal education, advocacy and progressive jurisprudence. – Maintenance of the highest standards of professional conduct, etiquette and discipline among lawyers. Promote networking opportunities among the members of the Association, international organizations, and with lawyers and law associations from other countries. – Promote the welfare, security, economic and professional advancement of members of the legal profession in Nigeria. – Create and maintain and Endowment Fund for the proper the observance and discharge of any of this aims. NBA promotes and protect principles of the Rule of Law and respect for human rights. NBA promotes Pro Bono services to the indigents in the society. Visit the website of Nigerian Bar Association NBA for more information. Click here.